I saw ZOO during this year's New York International Children's Film Festival. It was one of the great discoveries of the festival and the year. With the film opening Friday I'm reposting the review. After his father, the zookeeper, signs up to serve in the army and heads off to war, Tom decides to keep an eye on things. However when Belfast comes under air attack the government orders that the animals be killed Tom manages to get a baby elephant out of the zoo and hide it. 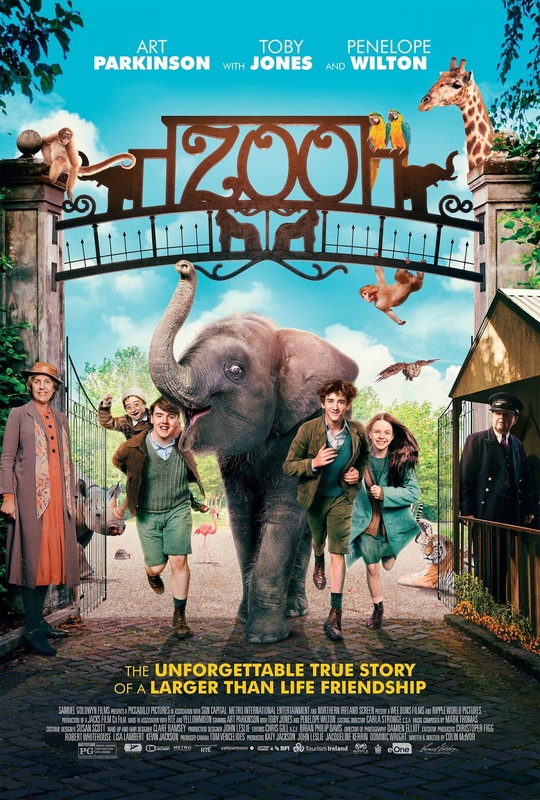 Based on a true story most people have ever heard, ZOO is a wonderful feel good family film. Beautifully acted and wonderful to look at, this is a film you fall into and go to another time and place. This is also one of those films that will make the kids in the audience bounce at the end and the adults wipe a tear or two from their eyes. While most assuredly a film for the whole family the film does not shy away from the darkness. While we do not see the actual destruction of the animals, we see enough to know exactly what happens and it breaks your heart. Also heartbreaking is as a result of this being set during war time. And if I say the turn may upset some smaller kids, it's only because I groaned "oh god no" loudly.